My son is 9 years old and going into 4th grade for the 2017/2018 school year. These are my curriculum choices for this school year. I am excited for him to use Growing with Grammar as I think he will be able to be more independent while learning. I like the layout of having one section to read each day and then an assignment that follows up with what he will have learned. 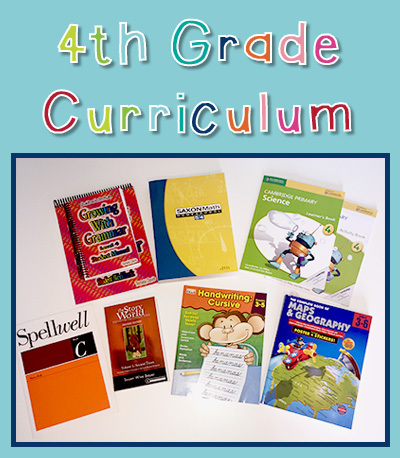 This is a new curriculum for us so I am excited to see how we like it. We used Saxon Math last year and he really liked it and asked to continue to use it. I think it fits his learning style really well and he will be able to be more independent with his Math this year. I had a hard time finding a science program that I really liked this year. I finally found this and fell in love with the program. It offers studies in the human body, living things and environment, solids, liquids, and gases, sound, and electricity and magnetism. Each section has experiments. I also bought the activity book for follow up to each lesson so he would have an activity to really grasp what he has read. With spelling last year I just gave him a list and an expectation to use it each day by writing the words three times or writing them colorfully. This year I wanted to have different activities to do with the spelling words and Spellwell really had everything I was looking for. Each week he will have a new list and activities for each day and then on Friday we will do a spelling test. This is the subject that both of my boys will do together. I am really looking forward to History this year. I like the fact that I will read the chapter each day and that we will have follow up questions and activities to do that come with the program. We will be using both the Book and Activity Book. Cursive is an area he struggled with last year. I found his print handwriting needed help so we ended up not doing much cursive the year before. Now that his print handwriting has improved he will be moving on to learning the basics of cursive. We will be starting off by following directions on a map, to then learning about the United States and the Continents. Both boys will be using the same workbook and we will work together throughout the year. Want to see what he used in the past? This is what we are starting with! I will update if we make any changes and review how we liked everything at the end of the school year!